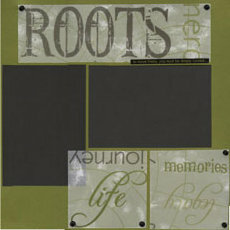 For your Heritage Scrapbooking Ideas, I found two sets of paper kits to show you. The first is by Ancestry.com and the second kit shows some layouts from the "Generations" kit from Club Scrap for March 08. 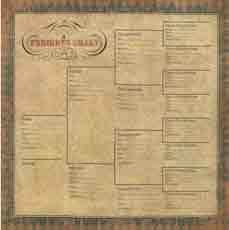 First, I found this Scrap Kit of paper by Ancestry.com. while I was on the A.C. Moore on-line web-site. I was very pleasantly surprised when I received it as it was much more than just the paper and stickers. I wanted to get it posted to the web site right away, so I did not take the time to actually scrap it. While the package has the contents listed as 12 Designer Papers, 8 Grand Adhesions and 18 Name/Label Stickers, there is really more. 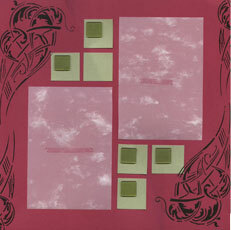 Here is a small sample of the background papers that came in the kit. 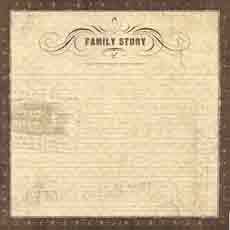 This page titled Family Record was on the front of the package so if you are shopping for the kit, you may be able to recognize it. Each of the ovals is die cut to be punched out. That way you can put a small photo behind the punch out - you don't have to cut your heritage photos, and you can be sure that the oval shape will be a smooth cut and look professional. There is also a small labeling space under each photo to write in relatives names. Here is the neat find about this kit. On the back are nice ideas for using them. 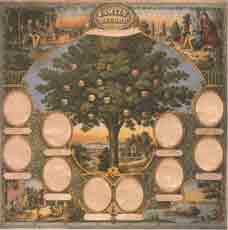 This Pedigree or Ancestral Chart is one of the most common forms used by genealogists. Some of the suggestions tell you to write the first draft in pencil & to capitalize surnames to avoid confusion with given names. It is also suggested that you start with yourself and work backwards and list all dates in international format, like 16 Mar 08 -- this way they will all be the same size. These Family Group Record pages are a standardized way to record genealogical information about one family - Parents and Children. 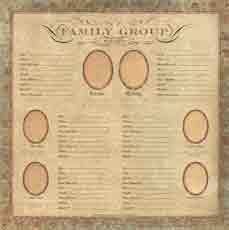 This set of Family Group papers is to be used with the Family Tree page. Again, the ovals can be punched out to insert a photo behind, or left intact in the event you do not have a photo. The first 2 ovals represent Father and Mother. Next to each oval is a place to write in Birth Date, Place of Birth, Date and Place of Marriage, Death, Place Buried, Father & Mother. 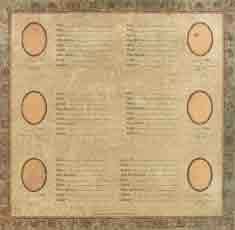 The ovals underneath represent children with the same options to fill in the important information. This Family Story page is one that you may want to get some extra copies of. Do a rough draft and make sure all your text will all fit on the one page. Actually you can put photos on here as well. This page can be used for several things, like interesting stories about certain family members or you could write about the major highlights of your own life. Or, to write an entire family history, think about it in decades, and write chronologically. You can conduct interviews with family members and put together stories from the interviews. Do this with your older family members first, - don't wait until it's too late to speak with them. Make it easier on yourself and conduct the interviews with either audio tape or video tape and you will have another cherished family heirloom. I call these the Heritage Journal Blocks. 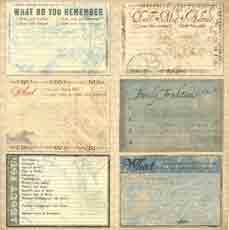 These can be cut apart and used on any pages that you may find to do your Heritage Scrapbook Layouts on. One very distinctive thing about most of the heritage scrapbook papers you will find is that the colors are subdued and appear somewhat distressed. They really go nicely with older photos that are not in color or with color photos that have aged and lost some of their original color. 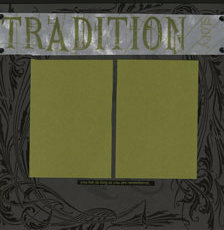 Heritage Scrapbooking Ideas: You can distress your own papers with a little sand paper on the edges and surfaces. Sometimes the paper is made with a white core and the white will show through where you sand off the colored top. Last but not least in this kit were additional labeling stickers and small journaling boxes on the left. These can be used on individual photos and layouts. On the right are the rest of the Grand Adhesions. These are layered and 3-dimensional with foam tape holding the layers together and are very intricate, well done and of course, match the papers in the kit. Overall, a really nice find. 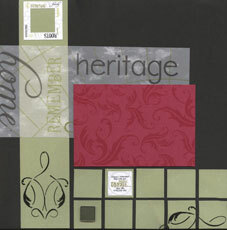 Heritage Scrapbooking Ideas: Another way to make you paper appear distressed and older is to tear the edges instead of cutting. This will help to blend in the change of paper color from one piece to the next and give an aged look. These beautiful Club Scrap Papers & Embellishments fit the bill for the Traditional Heritage Scrapbooking Ideas and Layouts with the subdued and muted colors. The black is really a very dark gray and the red is somewhat muted and matches with the light olive green. Papers actually too pretty to cover up with photos. 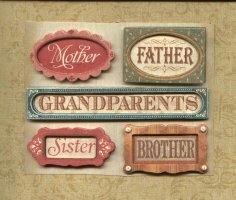 You can visit the Club Scrap website and look for the "Generations" kits to see the other Heritage Scrapbooking Ideas available.